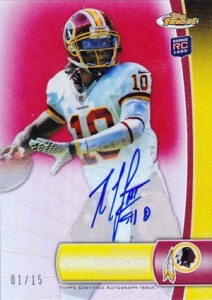 Home » Features » What Are the Top Selling Cards in 2012 Topps Finest Football? What Are the Top Selling Cards in 2012 Topps Finest Football? Can we make it official? 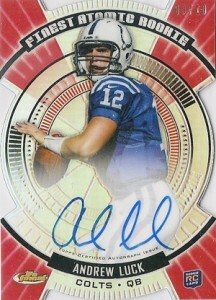 Entering the 2012 NFL season, collectors have made Andrew Luck the head of the rookie class. During its first week on the market, 2012 Topps Finest Football proves this. The Colts quarterback dominates the list of top eBay sales, accounting for eight of the 15 highest realized prices. Robert Griffin was a distant second. He had just five cards on the list, although one was the top earner. However, when you compare like cards, Luck's were higher. Leading all sales was one of the set's best cards. 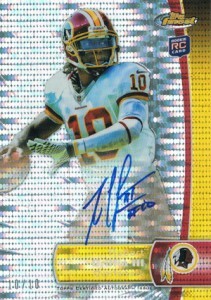 The 2012 Topps Finest Football Robert Griffin III Superfractor Autograph changed hands at $3,100. The one-of-one was originally listed with a $7,000 Buy It Now, but the seller accepted the sizable offer. From there, RG3's rookie rival took over. 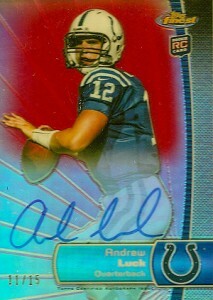 Two Andrew Luck Red Refractor Autograph reached four figures. Numbered to 15, one finished at $2,280. The second went for significantly less but still very high, closing at $1,299.99. 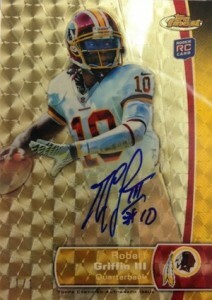 By comparison, the highest a Robert Griffin III Red Refractor Autograph reached was $665. Two Andrew Luck Pulsar Refractors sold for $950 and $895. 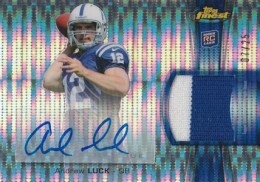 Only two of the top 20 opening-week 2012 Topps Finest Football eBay sales were of someone other than Luck or Griffin. 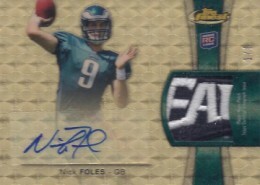 A Nick Foles Rookie Autographed Patch Superfractor closed at a penny less than $900. 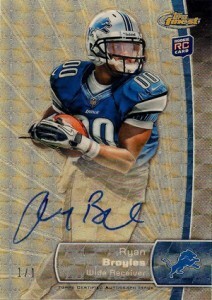 A Ryan Broyles Superfractor Autograph sold for an even $700. Data based on completed eBay auctions through August 28.